Our Disaster Recovery section will give you an option to setup and manage some aspects of the Disaster Recovery scenarios described in the AWS Disaster Recovery Overview article. Using our wizard for Disaster Recovery you will be able to make setup across AWS Regions as well as across AWS Accounts. Using our wizard you will be able to select source and destination regions and account as well as instances you want to replicate to Disaster Recovery region. In addition, you will get options to define the Disaster Recovery parameters for each resource. Name – name of your Disaster Recovery setup. The name must be unique across all of your DRs under the same account. Destination Region – AWS region that will be setup as the Disaster Recovery region. In other words, it is the region, where selected resource from source region will be replicated to. Setup Disaster Recovery under different AWS account – by checking this option you will be able to transfer your AWS EC2 resources to different AWS account. 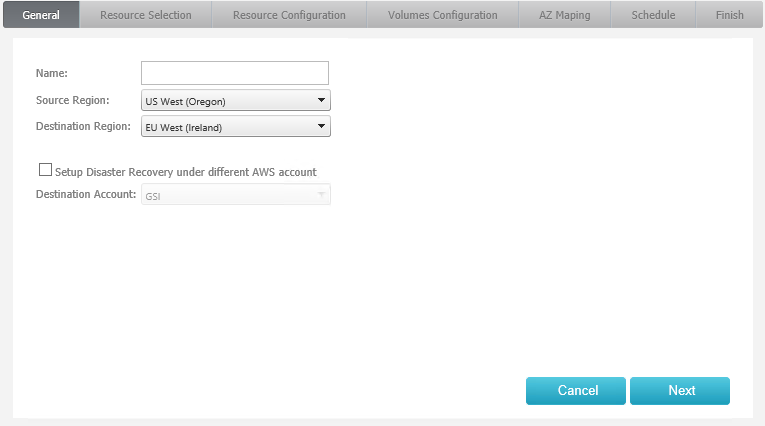 Destination Account – AWS account to which you want to setup/transfer EC2 resources. The Resource Selection tab will list all Instances and Elastic Load Balancers currently accessible in source region. 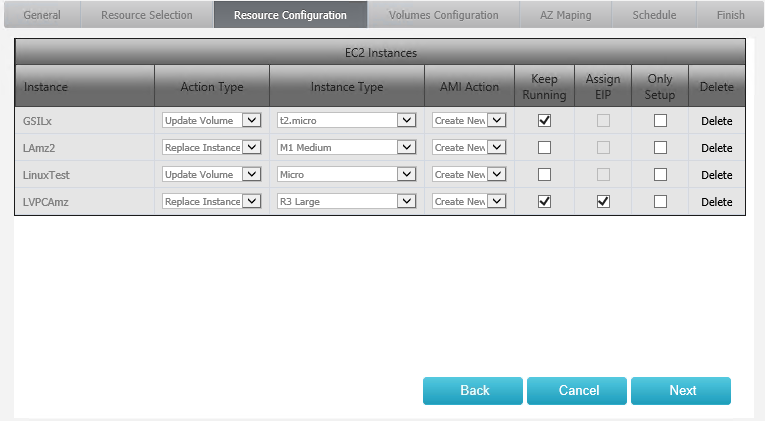 You can select any instance that you want to replicate to Disaster Recovery region. 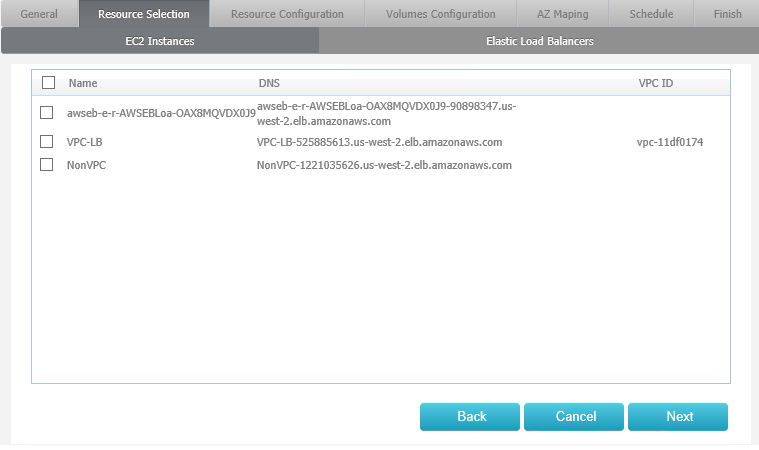 Also you can select Elastic Load Balancer that you want to setup in DR region. When you select ELB, you have to select at least one instance, which is currently attached to that ELB. (This option applies only to ELB, which has already attached instance(s)). For ELB while using SSL, all certificates need to be manually copied and setup in destination Disaster Recovery region. Most attributes of the instances from source region will be replicated to the destination region including: Security Groups, Local IP, Source Destination Check, and Sub-networks; along with all VPC parameters such as, Subnets, Route Tables, Internet Gateway, and DHCP Options. The resource configuration tab lets you specify disaster recovery option for each instance selected on previous tab. Initial Setup Action: this option will create AMI of the instance from the source region and copy it over to the destination region. The new instance won’t be launched from that AMI. There will be additional option available for this type of replication described latter in this document. Scheduler Action: create and copy a new AMI image of the source instance to the destination region. Deregister previous AMI image in destination region.  before the new instance is launched, the old one will be terminated.  if the replacing instance was attached to ELB or was setup as NAT server, then load balancer or route table will be updated adequately. Initial Setup Action: the initial action will be the same as in the Replace Instance option. Scheduler Action: the snapshot of the volume will be taken and copied over to the destination region. The old volume attached to the instance in destination region will be detached and deleted. The newly copied snapshot will be converted into volume and attached to the instance. Instance Type – this option lets you specify the type of the EC2 Instance in destination region. The new instance can have different size from source instance. -	New: this option will trigger a creation of new image of the source instance and copy it to destination region. -	AMI ID: if the image of the selected instance was already copied to the destination region, you can skip creation of the new image and use one in Disaster Recovery region. Keep Running – this option allows you to specify if the instance after launch supposed to be running or be shutdown. Allocate EIP – when this option is checked off, the new Elastic IP will be allocated and associated with the newly launched instance. This option is active only when selected instance in the source region has associated EIP. Only Setup – this option lets you specify whether the selected instance will be created only during initial disaster recovery setup or should be also updated based on the scheduler. Delete – this option lets you delete the instance from the list. When you edit existing setup, this option will not cause deletion of the instance in destination region, but will remove it from scheduler list. The volume configuration tab will be active only, when at least one of the instances on previous tab had been selected as “Update Volume” action type. Stop Instance – this option lets you specify if you want to stop instance before the old volume is replaced with the new one. This option should be checked when the selected volume(s) contain database or other data used by any application; where sudden loss of access to hard drive could cause potential issue. When the root drive is selected (/dev/sda1) the instance must be stopped regardless of the chosen options. To expend the list of the volumes attached to the given instance, click the arrow on the right. Update – when checked, volume in Disaster Recovery region will be updated based on the schedule. 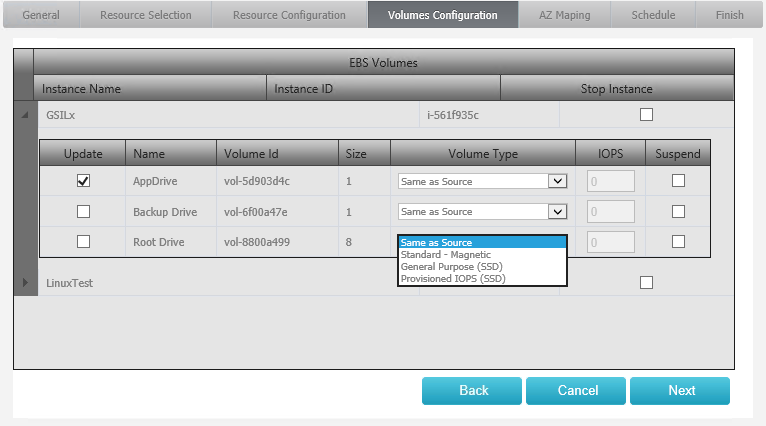 Volume Type – this option lets you choose what type of the EBS volume you want to restore during scheduled update process. 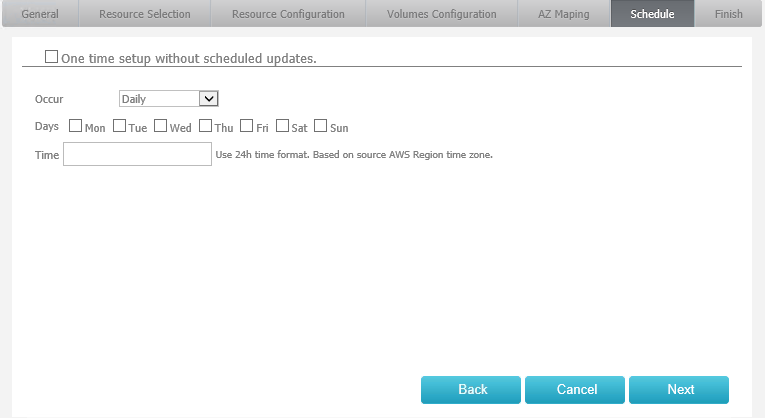 Availability Zone mapping tab gives you an option to map zones from source region to the destination region. This feature is helpful when your source resources are spread between multiple availability zones. The Schedule tab allows you to setup interval of how frequently you want to update your resources in Disaster Recovery region. “Don’t use scheduler to update Disaster Recovery resources on regular basis” option. After clicking the “Finish” button, the new setup will be created. The process of initial setup of the disaster recovery region will start within 5 minutes after completion of the wizard. You won’t be able to modify any options of your Disaster Recovery plan until the initial setup is finished. All Disaster Recovery plans will be listed above the wizard. You can track progress of the setup by refreshing the list. Boot – this option will launch instances marked as “Only Copy” under Disaster Recovery plan. Both “Boot” and “CloudFormation” options will be available only, when at least one instance was marked as “Only Copy” on configuration tab in the wizard. When you use “Cloud Formation” script, there won’t be an option to attach new instance to Elastic Load Balancer. Also, in both cases, the route table won’t be updated even if the created instance serves as the NAT server. Despite Disaster Recovery plan setup for each instance, whenever at least one of them is inside VPC, then the entire VPC will be recreated in destination region with the same attributes. 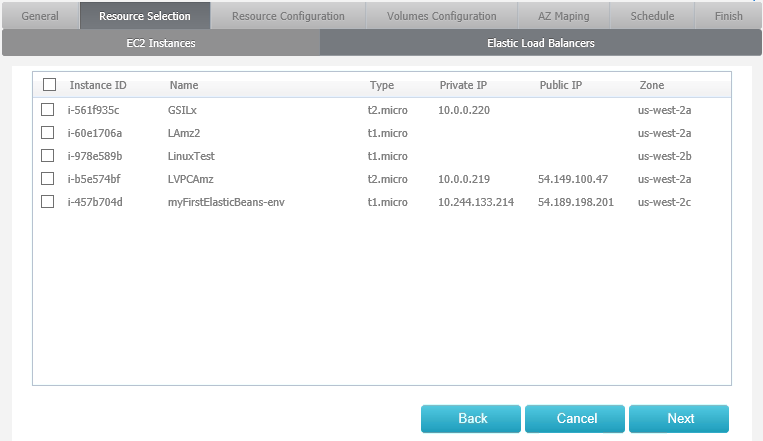 Each Elastic Load Balancer selected in the wizard will be automatically recreated in the destination region. If ELB is using SSL connection, all certificates need to be manually setup under the new ELB. Watch video showing our wizard in action.